Pancakes - Right, because he's Canadian... and the maple syrup. Silver dollar pancakes. I just hope it's not silver dollars that are like those damn Canadian coins that vending machines won't take because no one likes those. 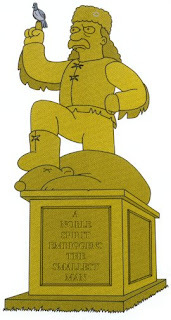 Jebidiah Springfield's silver tongue - Obscure Simpsons reference? Enjoy it if you can. A Silver Delorean - A Delorean he no doubt had converted into a time machine. This is what the baseball season is like in November people. Movie and cartoon references. My apologies. Let's just hope Theo is planning on having Thanksgiving at the Lackey, Holliday and Halladay residences this year.